After America leaves Syria, what next? IT DID NOT take long for America’s decision to withdraw from Syria to be felt across the Middle East. The Syrian regime, along with its Russian and Iranian allies, rejoiced. Arab states hurried to make up with Syria’s leader, Bashar al-Assad. The Arab League will soon debate his return to the fold. America’s Kurdish allies, crying betrayal, urged him to help fend off a looming Turkish invasion. Israel scrambled to contain the damage. With a single tweet on December 19th—“We have defeated ISIS in Syria, my only reason for being there”—President Donald Trump has sent the region’s geopolitics spinning like an old mechanical airport display. It announces big changes: an American exit, a triumph for Iran and Russia, the return of Syria and the repositioning of everybody else. 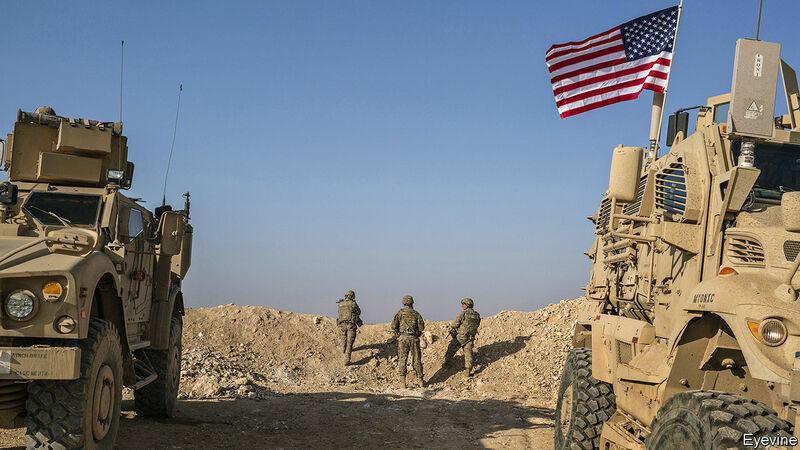 Mr Trump’s decision to pull out America’s 2,000-odd troops from eastern Syria astonished friend and foe alike, none more than his own envoys to the region. Granted, in April last year he declared that American forces would soon leave. But in September his administration announced that, in fact, they would remain indefinitely to ensure the lasting defeat of Islamic State (IS), the departure of Iranian and other foreign forces and the creation of an internationally acceptable government. On the eve of Mr Trump’s about-turn, James Jeffrey, his special envoy for Syria, scoffed at the idea that Mr Assad might simply wait for America to give up: “I think if that’s his strategy, he’s going to have to wait a very long time.” Brett McGurk, the American envoy for the war against IS, resigned within days. As one Arab minister notes wearily: “The decision was a total surprise. But not the fact that America changed policy. This is the fifth or sixth shift in America’s position in Syria.” Might Mr Trump change his mind again? On December 30th Lindsey Graham, a Republican senator, seemed to convince Mr Trump to slow down the withdrawal, to take place over four months rather than one. Israel and Jordan were lobbying for American forces to remain in some areas, particularly Tanf in the south. Mr Trump casts himself as the antithesis of Barack Obama. He ripped up his predecessor’s nuclear deal with Iran and reimposed sanctions on its clerical regime, embraced Saudi Arabia and recognised Jerusalem as Israel’s capital. Whereas Mr Obama hesitated to take military action against Mr Assad for using chemical weapons in 2013, Mr Trump fired volleys of cruise missiles at Syrian bases. Yet Mr Trump may be more like Mr Obama than he would admit, especially in his desire to reduce America’s involvement in the Middle East, where presidents have suffered many failures and few successes. Regarding Syria, Mr Trump says explicitly what Mr Obama’s reluctance to engage implied: America has no vital interests there. “There is much continuity between Trump and Obama: the US does not have the answers to the complicated problems of the Middle East, and is not willing to fight a major war to try to solve them,” says Philip Gordon of the Council on Foreign Relations, a think-tank, who had been in charge of Middle East policy in Mr Obama’s White House. He argues, though, that the American operation in Syria is relatively small and cheap, and that Mr Trump’s impetuous manner has caused much damage. To many in Washington, Mr Trump is thus throwing away America’s cards for no benefit. It controls the oil wells that produce 95% of Syria’s oil and much of its gas; the waters of the Euphrates; prime agricultural land; and five large military bases. The immediate losers are Syria’s Kurds, whose dream of creating an autonomous region in Syria looks imperilled. Their fighters, the People’s Protection Units (YPG), have proven to be the most capable allies in America’s fight against IS, pushing the jihadists back from the Turkish border to the Iraqi frontier. America’s presence, in turn, helped shield the YPG from attack by Turkey, which regards them as one and the same as its own Kurdish separatist insurgents, the Kurdistan Workers’ Party (PKK). Turkish forces last year overran the Kurdish enclave of Afrin west of the Euphrates; the Turks have threatened to do the same imminently east of the river, where the Americans are mostly deployed. Mr Trump’s withdrawal announcement came after he spoke to Turkey’s president, Recep Tayyip Erdogan. Whether Mr Trump feared a clash between American and Turkish troops, or accepted Mr Erdogan’s promise to reduce the remaining IS enclaves, is unclear. A possible sale of American-made Patriot missiles may have helped their understanding. But Mr Erdogan’s priority will be to push away Kurdish fighters on Turkey’s border, not to fight IS, which still has thousands of fighters farther to the south. That may give the jihadists an opportunity to re-emerge, as they did after Mr Obama’s withdrawal from Iraq in 2011. The biggest winner is undoubtedly Mr Assad. In a war that has killed some 500,000 people and displaced about 13m, Mr Assad seemed on the brink of defeat in 2015. But through brutal tactics—and with the help of Russia in the air, and Iran and Shia militias on the ground—he has regained most of his country’s heartland. He seems determined to keep fighting until he has recovered all his territory. The YPG has lost no time in calling on Syrian forces to enter the district of Manbij to deter Turkey. Mr Erdogan will, in any case, have to calibrate any action against the Kurds. 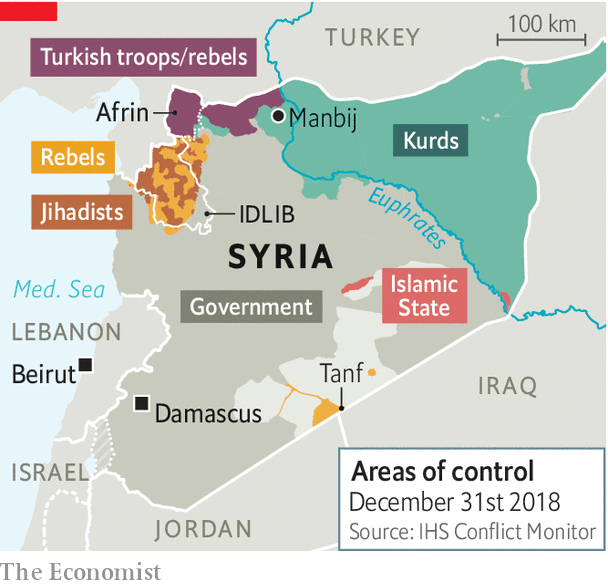 Russia and Iran may resist any attempt by Turkey to help its hotch-potch of Sunni Arab allies (jihadists linked to al-Qaeda are also mixed in with them) extend their fief and control the border. “Turkey will have to be careful about the other side’s red lines,” says Oytun Orhan, of ORSAM, a think-tank in Ankara. Failure to do so could precipitate a Syrian offensive in Idlib, the last bastion of the anti-Assad opposition. Sunni Arab states are shifting from supporting the Sunni rebels to reconciliation with Mr Assad. On December 16th Sudan’s president, Omar al-Bashir, became the first Arab head of state to visit Damascus since the Arab spring in 2011. On December 27th the United Arab Emirates re-opened its embassy in Damascus. A meeting of Arab leaders in Beirut later this month is expected to discuss inviting Mr Assad to a summit in Tunisia in March. Although Saudi Arabia remains wary, Syrian officials see hope in the replacement of the hawkish Saudi foreign minister, Adel al-Jubeir, by the milder Ibrahim al-Assaf. As with their re-engagement in Iraq, Gulf Arabs hope that diplomatic ties will over time give Syria reason to reduce its dependence on Iran—even though Mr Assad will forever remain indebted to it for his survival. If nothing else, Arabs are dismayed that the fate of Arab Syria is being determined mainly by non-Arab powers—Russia, Iran and Turkey. Iran, for its part, is urging Iraqi forces to help fill the vacuum left by America in Syria. Iraq’s prime minister, Adel Abdul Mahdi, has offered unspecified support; Iraqi planes have already been striking at IS pockets in Syria. If America leaves Syria entirely, Iran will more easily be able to establish a land bridge to Lebanon, supplementing the air bridge now in operation, to supply its powerful ally, Hizbullah. Having thus saved Mr Assad and enabled his rehabilitation, Russia is supplanting America as the region’s power-broker. Russia may have acted as the air force of the “Shia axis”, yet it has strong ties with all the main actors, including Israel and Gulf states. Its readiness to stand by even its most repulsive allies makes it seem, to Sunni Arab leaders, more reliable than America. Saudi Arabia has worked closely with Russia to co-ordinate oil output. No one could miss the exuberant high-five in November between Mr Putin and Muhammad bin Salman, the Saudi crown prince who is accused of ordering the murder of a journalist, Jamal Khashoggi. Israel, too, has long courted Russia. Its prime minister, Binyamin Netanyahu, has repeatedly met Mr Putin in the hope of prising him away from Iran, or at least ensuring that Israel can act against Iran and its allies. Mr Trump promised that “we are going to take great care of Israel.” He then alarmed it saying the Iranians could “frankly do whatever they want” in Syria. BEYOND THE Great Wall and the chain of rugged hills through which it snakes, workers are putting the finishing touches to a colossal edifice. The beams of its roof are curved, with golden tiles reminiscent of those that adorn the Forbidden City, 70km to the south-east. 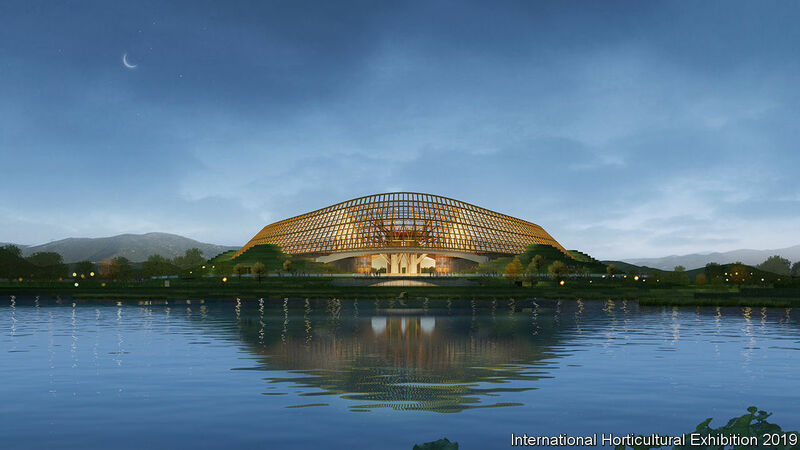 The building itself curves, too, in a shape that its architects say resembles a ruyi—a traditional Chinese talisman (pictured is an artist’s impression). They say it invokes a longing for fulfilment of the “Chinese dream”. That is a cherished slogan of China’s leader, Xi Jinping, whose wish is that China should emerge as a global giant. As a state news agency puts it, the building conveys the “imposing manner of a great power”. The China Pavilion, as the structure is called, is for an international flower festival in Yanqing, a satellite town of the capital. The show will open on April 29th and last for more than five months. It will be the biggest expo of any kind that China has staged under the aegis of the Paris-based Bureau International des Expositions since the Shanghai World Expo in 2010. It will be the biggest horticultural one ever held anywhere. And it will be the centrepiece of the largest political celebration in China in a decade: the 70th anniversary of the founding of the Communist state. The big day itself will be on October 1st, as the flower show enters its final week. The choreography of the coming year will convey Mr Xi’s dream to perfection. In April, on a date to be announced, foreign leaders will gather in Beijing to discuss the president’s Belt and Road Initiative—a scheme involving billions of dollars of Chinese loans to, and investment in, infrastructure projects around the world. A senior Chinese diplomat has said it will be “the most important diplomatic event” in China this year. The clout that countries wield with economic largesse is sometimes described as “hard power”. More power of an even harder kind is likely to be shown off on October 1st when, if tradition is upheld, the country’s armed might will be paraded through central Beijing: tanks, jets, nuclear missiles and thousands of troops shouting “hello chairman” to their commander-in-chief, Mr Xi. The flower expo will be the soft-power filling between these events and involve many times more people—16m visitors are expected, organisers say. Officials were keen to ensure that a record number of countries and international organisations would put on displays at the expo. They have succeeded: at least 110 have signed up. Many people in the capital are unaware of the scale of what will soon unfold. The site in Yanqing is on the outer periphery of Beijing municipality, far beyond its urban core (see map). The Great Wall at Badaling is Yanqing’s biggest attraction. For now, tourists have little reason to head beyond it to the district’s main town, near to which, on requisitioned farmland, the expo will be held. It will be the biggest international festival in Beijing since it staged the Olympic games in 2008. On the riverside spot thousands of workers have built a 960-hectare park, half as big again as the one made for the Olympics, which was previously the city’s record-setter. The expo will fill the new park, with its enclosed area covering more than half of it. It will be of huge political importance. This is reflected in the heavyweight line-up of its organising committee. It includes some of the country’s most powerful officials. Two of them are members of the ruling Politburo: Hu Chunhua, who is a deputy prime minister, and Cai Qi, who is the party chief of Beijing and a protégé of Mr Xi (Mr Cai calls the expo a “glorious political task” handed to the city by the central leadership). Also on the team are 18 deputy heads of ministries (including those in charge of China’s police and spies) and Jiang Zehui, a first cousin and adoptive sister of Jiang Zemin, a former president. Organisers have been told to let their work be guided by “Xi Jinping Thought”. They have clearly followed orders. The event will be suffused with symbolic references to Mr Xi’s favourite topics, from pursuing the “Chinese dream” to creating a “beautiful China”. The expo’s official theme, “Live green, live better”, echoes his calls for a better environment. That the festival is taking place in a city so acutely short of water appears not to worry officials. A diversion scheme that brings water from the distant Yangzi river basin began supplementing the city’s supply in 2014. This has freed up a reservoir near the expo site to ensure the plants stay moist. To ease the flow of visitors, the city has been on an infrastructure spending spree. There are already two motorways, the G6 and the G7, that lead to Yanqing (visitors to the Great Wall often use them). But they are frequently congested. On January 1st a new expressway, more than 40km long, was opened. It connects the northern suburbs of the capital with Yanqing. Planning documents for the new road, called the Xing-Yan, make it clear that the expo has been one of the main reasons for building it to this schedule. It has cost more than 13bn yuan (nearly $2bn) and involved boring a 5.9km tunnel beneath the Great Wall—about half the length of the one beneath Mont Blanc and the longest in Beijing’s road network. It has also been controversial: some environmentalists say the route threatens an ecologically sensitive area. The view is crucial. Near the China Pavilion workers have built a hill, on the top of which they are erecting a huge four-storey pavilion in ancient architectural style. It has involved a team of nearly 300 craftsmen skilled in traditional techniques. 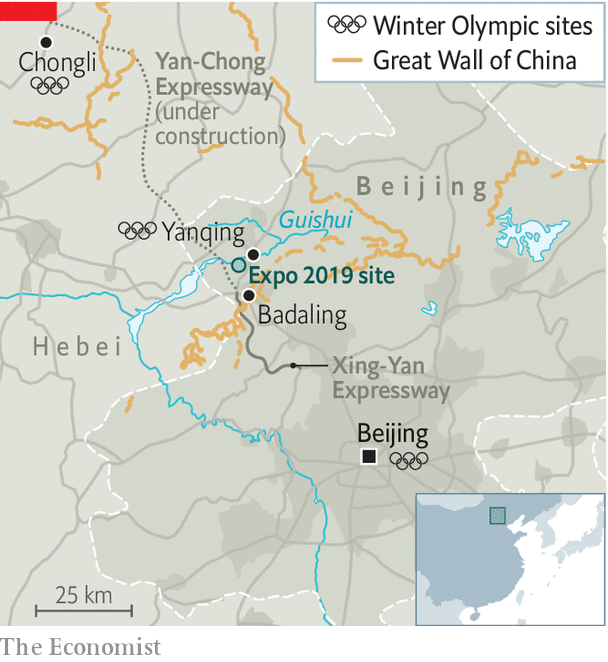 It will provide visitors with a vantage point from which to survey the expo site and the hills 10km away on which the Great Wall can be dimly discerned. That is important: organisers like to call the event “the horticultural expo at the foot of the Great Wall”, aiming for a soft-power multiplier effect. The view from the pavilion provides proof of this link—on a good day. Smog sometimes renders even the hills invisible, let alone the wall. But above all, it is the flowers that the party hopes will make its soft-power point. It loves them as a political tool. 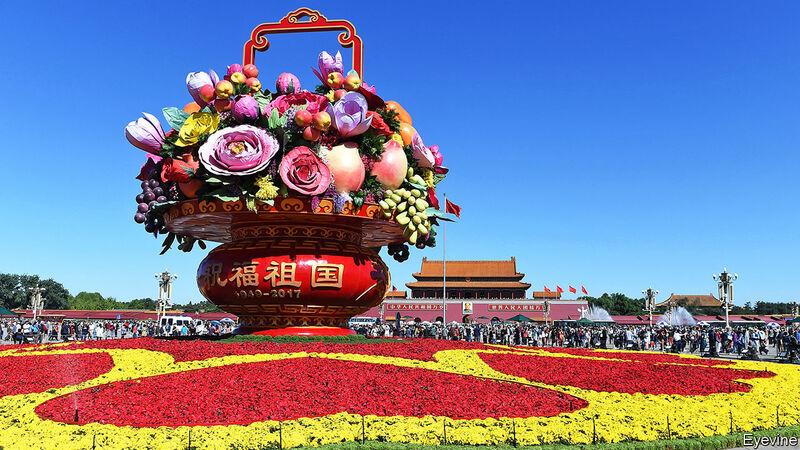 To mark the anniversary of Communist rule, Tiananmen Square is adorned every year with huge floral arrangements. The centrepiece in 2018 was in the form of a basket-shaped object with petals radiating from its base—17 metres high and 50 metres across—an assemblage of potted plants with, as always, a message (see picture). State media said they symbolised the Chinese people’s unity with the party with “Comrade Xi Jinping as the core”. International horticultural shows are normally less to do with the national origins of plant species, and more about showing them off and sharing expertise in cultivating them. Beijing’s show will be different. One of its aims will be to highlight the global impact of Chinese flora. Visitors will be reminded that everything from tea and rice to many of the plants that are grown in Western gardens have Chinese origins. In April state television will begin showing a ten-part series called “Chinese plants that have changed the world”. Officials worry that some Chinese may not be in a mood for celebration as the economy slows and mutterings grow about Mr Xi’s leadership. During the expo there will be sensitive dates that dissidents will be eager to mark. The first will occur just a few days after the show opens: the 100th anniversary on May 4th of a student movement that led to calls for “Mr Science” and “Mr Democracy” to be welcomed in China. The party officially marks May 4th as youth day, but it fears appropriation of it by disaffected youngsters. The movement’s 70th anniversary in 1989 gave huge impetus to the pro-democracy unrest that engulfed the country that year. On June 4th it will be the 30th anniversary of the crushing of those protests. Police will be on full alert. Stirrings of activism on some university campuses have already spooked them. A handful of students at Peking University staged a rare on-campus protest on December 28th against official interference in their Marxist student society. Around the expo site itself, some people are grumbling. Building the venue and the new infrastructure has involved relocating hundreds, possibly thousands, of people. In Yanqing the authorities have used the expo and the games as a reason to knock down slums. A handful of residents who have refused to move vent anger at local officials for offering what they regard as derisory sums in compensation. “Bandits,” fumes one woman. “This is all just an excuse to get money in their pockets,” says a 75-year-old retiree. In downtown Beijing, residents have other reasons to seethe. Since November 2017, when 19 migrant workers were killed in a fire in the south of the city, the authorities have been using the pretext of fire safety to accelerate efforts to push migrants out of the city by closing places where they work and the ramshackle housing in which they live. As a result, many of Beijing’s markets have been shut down. Ironically, they include those selling cut flowers. Chairman Mao briefly encouraged dissent with the immortal words “Let a hundred flowers bloom, let a hundred schools of thought contend”—before imprisoning or persecuting hundreds of thousands of those who took him at his word. No one, however, is likely to misinterpret the party’s signals in a year that will be florescent with symbolism. As the party often reminds officials around the country, unrest should be nipped in the bud. 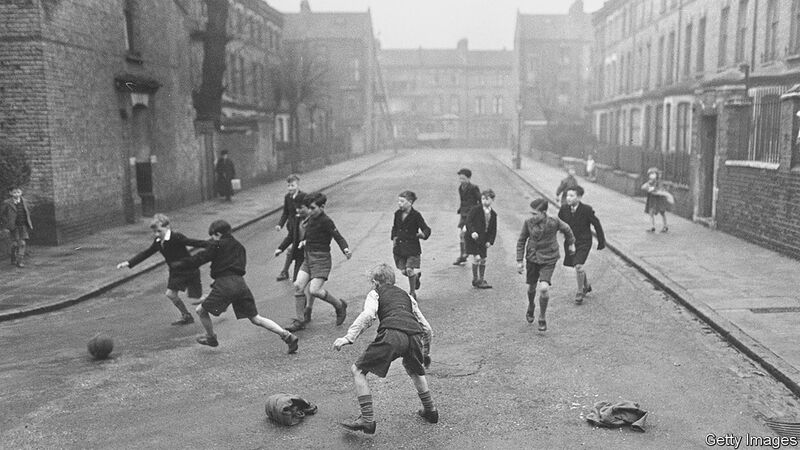 “WHEN I WAS a kid, we were out and about all the time, playing with our friends, in and out of each other’s houses, sandwich in pocket, making our own entertainment. Our parents hardly saw us from morning to night. We didn’t have much stuff, but we came and went as we liked and had lots of adventures.” This is roughly what you will hear if you ask anyone over 30 about their childhood in a rich country. The adventures were usually of a homely kind, more Winnie the Pooh than Star Wars, but the freedom and the companionship were real. Today such children will spend most of their time indoors, often with adults rather than with siblings or friends, be supervised more closely, be driven everywhere rather than walk or cycle, take part in many more organised activities and, probably for several hours every day, engage with a screen of some kind. All this is done with the best of intentions. Parents want to protect their offspring from traffic, crime and other hazards in what they see as a more dangerous world, and to give them every opportunity to flourish. And indeed in many ways children are better off than they were a generation or two ago. Child mortality rates even in rich countries are still dropping. Fewer kids suffer neglect or go hungry. They generally get more attention and support from their parents, and many governments are offering extra help to very young children from disadvantaged backgrounds. As adolescents, fewer become delinquents, take up smoking and drinking or become teenage parents. And more of them finish secondary school and go on to higher education. The children themselves seem fairly happy with their lot. In a survey across the OECD in 2015, 15-year-olds were asked to rate their satisfaction with their life on a scale from zero to ten. The average score was 7.3, with Finnish kids the sunniest, at nearly 7.9, and Turkish ones the gloomiest, at 6.1. Boys were happier than girls, and children from affluent families scored higher than the rest. That is not surprising. Prosperous parents these days, especially in America, invest an unprecedented amount of time and money in their children to ensure that they will do at least as well as the parents themselves have done, and preferably better. Those endless rounds of extra tutoring, music lessons, sports sessions and educational visits, together with lively discussions at home about every subject under the sun, have proved highly effective at securing the good grades and social graces that will open the doors to top universities and well-paid jobs. Working-class parents in America, for their part, lack the wherewithal to engage in such intensive parenting. As a result, social divisions from one generation to the next are set to widen. Not so long ago the “American dream” held out the prospect that everyone, however humble their background, could succeed if they tried hard enough. But a recent report by the World Bank showed that intergenerational social mobility (the chance that the next generation will end up in a different social class from the previous one) in the land of dreams is now among the lowest in all rich countries. And that is before many of the social effects of the new parenting gap have had time to show up yet. This special report will explain what has led to these momentous changes in childhood in America and other rich countries, as well as in middle-income China. They range from broad social and demographic trends such as urbanisation, changes in family structure and the large-scale move of women into the labour force in recent decades to a shifting emphasis in policy on the early years and the march of digital technology. Start with the physical environment in which children are growing up. In rich countries the overwhelming majority now lead urban lives. Almost 80% of people live in cities, which have many advantages, including better opportunities for work, education, culture and leisure. But these often come at a cost: expensive housing, overcrowding, lack of green space, heavy traffic, high air pollution and a sense of living among strangers rather than in a close-knit community. This has caused a perception of growing danger, even though crime in Western countries in the past few decades has declined, so statistically the average child is actually safer. Even more important, the domestic environment for most children has changed profoundly. Families have become smaller, and women bear children far later than they did only a couple of generations ago. In the vast majority of rich countries the average number of children a woman will have is now well below the replacement level of 2.1. Households with just one child have become commonplace in Europe and the more prosperous parts of Asia, including China. That means each child has more time, money and energy invested in it, but misses out on the hustle and bustle of a larger household. Families have also become far more fluid. Rates of marriage have declined steeply, and divorce has become widespread. Many couples in America and Europe now cohabit rather than marry, and a large and growing proportion of children are born out of wedlock. Far more of them, too, are being brought up by lone parents, overwhelmingly mothers, or end up in patchwork families created by new sets of relationships. Again, this happens far more often at the bottom of the social scale than at the top. At the same time the number of women going out to work has risen steeply, though in recent years the trend has slowed. The post-second-world-war model of the nuclear family with a breadwinner husband, a homemaker wife and several children has become atypical. In America the share of women of working age in the labour force has risen from 42% in 1960 to 68% in 2017. To a greater or lesser extent the same has happened in other rich countries. Mothers now mostly return to work within a year or so of giving birth, not five or ten years later. In the absence of a handy grandmother, the child, even at a young age, will probably be looked after outside the home during the working week. The first few years of a child’s life are now receiving more attention as new evidence has emerged about its vital importance in the development of the brain. James Heckman, a Nobel prize-winning American economist, has suggested that early investment in a range of measures from high-quality child care to support programmes for parents offers excellent returns, far better than remedial interventions later in life. Governments in many countries have started to increase the number of public child-care and kindergarten places to supplement private provision, both to encourage more women to take paid jobs and to promote the development of young children from less privileged backgrounds. This report will look at the wide variety of early-years care on offer in different countries (ranging from plentiful and relatively cheap in the Nordics to scarce and often eye-wateringly expensive in the Anglo-Saxon countries, with most of the rest of Europe somewhere in between), and try to assess what difference it makes. In East Asia this is the first rung of a fiercely competitive educational ladder. The report will also consider the effect on children of an array of screen-based devices, from televisions to smartphones, offering a feast of passive entertainment, interactive computer games and the opportunity to connect with peers remotely. Not long ago children used to rile their parents by declaring they were bored, but now “being bored is something that never has to be tolerated for a moment”, writes Sherry Turkle of MIT, an expert on digital culture. In rich countries the vast majority of 15-year-olds have their own smartphone and spend several hours a day online. There are growing concerns that overuse might lead to addiction and mental illness, and that spending too much time sitting still in front of a screen will stop them from exercising and make them fat. The digital world also harbours new risks, including cyberbullying and sexting. But the first thing this report will explore is the new face of the institution still central to any child’s life: the family. His advice now seems quaint. Of the ten most expensive films ever made, Disney is responsible for six. In 2012 the studio hired Alan Horn as its chairman after a successful stint at Warner Brothers, where he had devoted a hefty share of the budget to a handful of “event films”, such as the Harry Potter series. If the average American only sees around five movies a year, he reasoned, they are most likely to opt for “something of high production value, be it because of the story, or the stars involved, or the special visual effects”. That approach can backfire. One calculation by Stephen Follows, a film consultant, implies that half of Hollywood productions with budgets over $100m lose money. When Mr Horn arrived at Disney, it was lurching towards two of the worst-ever box-office flops. “John Carter” (2012) and “The Lone Ranger” (2013), a pair of untried action stories, lost around $200m each. But since then the studio seems to have found a magic formula: extravagant remakes of animated fantasies that audiences already love. Discounting Mr Katzenberg’s dim view of blockbusters can evidently be risky, but big bets seem safer if film-makers eschew his yen for novelty, too. Or so Disney’s recent record suggests. “Cinderella” (2015) made $535m from a budget of $95m. “The Jungle Book” (2016) took $963m from $175m. The $300m marketing and production budget of “Beauty and the Beast” (2017), starring Emma Watson, Emma Thompson, Ewan McGregor and Ian McKellen, made it the most expensive musical ever. Within ten days of its release it was the highest-grossing film of its genre, eventually making $1.2bn in ticket sales. According to the Hollywood Reporter, Disney has been the most profitable studio for the past four years, earning more than $7bn at the global box office in 2016 and 2018. Its share price has risen by more than 150% since 2012. Princesses and talking animals are not the only characters to have been summoned back to the screen: audiences have been swamped by hordes of wizards, cape-wearers, dinosaurs and Jedi. But in this fairy-tale realm, Disney has an edge. Generations of children grew up on its animated backlist, and enough time has passed to retell the classics using new technology (and for fans to take children of their own). Reboots of old flicks have actually become less common in Hollywood overall, falling from 17% of top films in 2005 to 4% in 2017 (though prequels and sequels abound). But they are one of Disney’s staples. In 2019 it will add “Dumbo”, “Aladdin” and “The Lion King” to its roster of “live-action remakes”, which replace the original cartoons with filmed footage and computer-generated imagery. “Pinocchio”, “Snow White”, “James and the Giant Peach”, “Peter Pan” and “The Little Mermaid” will follow. Today that means attracting stars—Ms Watson as Belle, Donald Glover and Beyoncé as Simba and Nala, Will Smith as the Genie—and directors who reinforce each title’s strengths. 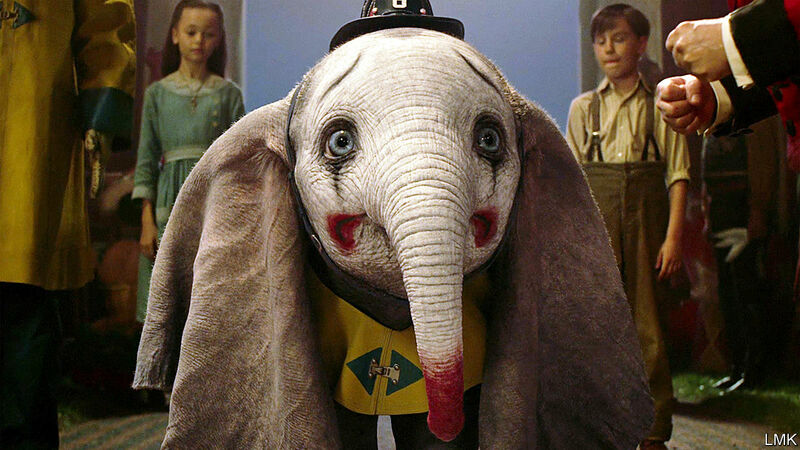 Tim Burton is a good fit for a story about a persecuted circus elephant and a nefarious entertainment magnate, because Dumbo’s outsider status is “a central characteristic that also runs through all of [Mr Burton’s] work”, according to Derek Frey, the film’s producer. Guy Ritchie’s aptitude for raucous action sequences lends itself to “Aladdin”, a fable about a mischievous street urchin. Producers and directors can now draw on astoundingly sophisticated computer-generated effects. Except for the actor who played Mowgli, “The Jungle Book” was entirely digital; the authentically lush rainforest and convincing animals earned an Oscar. Jon Favreau, the director, will apply the same techniques to “The Lion King”. “We can put any animal next to a real one and not be able to tell the difference,” claims Richard Stammers, the visual-effects supervisor on “Dumbo”. The animators size up muscle, the wrinkles of skin and the movement of fur. Lacking an airborne elephant to copy, researchers studied the physics of large birds. For imaginary creatures such as the Beast, animators use the latest motion-capture technology, which tracks actors’ movements and facial expressions and then transposes them onto digital figures. The uncanny realism instils a sense of wonder of its own. These revamps are not the only way Disney is ransacking its canon. In 2018 it released “Mary Poppins Returns” and a film about Christopher Robin, a pal of Winnie-the-Pooh’s; Cruella de Vil, Rose Red (Snow White’s sister), Tinker Bell and Prince Charming are all in line for their own movies. Fears that Disney would tarnish its family heirlooms with these do-overs and spin-offs seem to have been unfounded. On Rotten Tomatoes, a review-aggregator site, audiences give “The Jungle Book” an 86% approval rating—a similar score to the original’s, as is that of the new “Cinderella”. Still, Mr Katzenberg’s insistence on “fresh, new stories” has not been wholly discredited. There are only so many venerable cartoons to revisit, and the exciting novelty of seeing real actors and realistic animals breathe life into fantastical yarns may fade. Franchise apathy has already struck: “Solo: A Star Wars Story” (2018) received decent reviews but failed to break even. The circle of live-action films may yet turn out to be a wheel of fortune.